When it comes to selecting the best countertop for the kitchen, granite stone tops the range with its looks and several advantages that it has on offer. With too many options in colours and design to choose from, you have many ways to define the look of the kitchen when you opt for the granite countertop. As no two granites are same when it comes to the patterns, you can be sure of having the most unique stone in your kitchen. 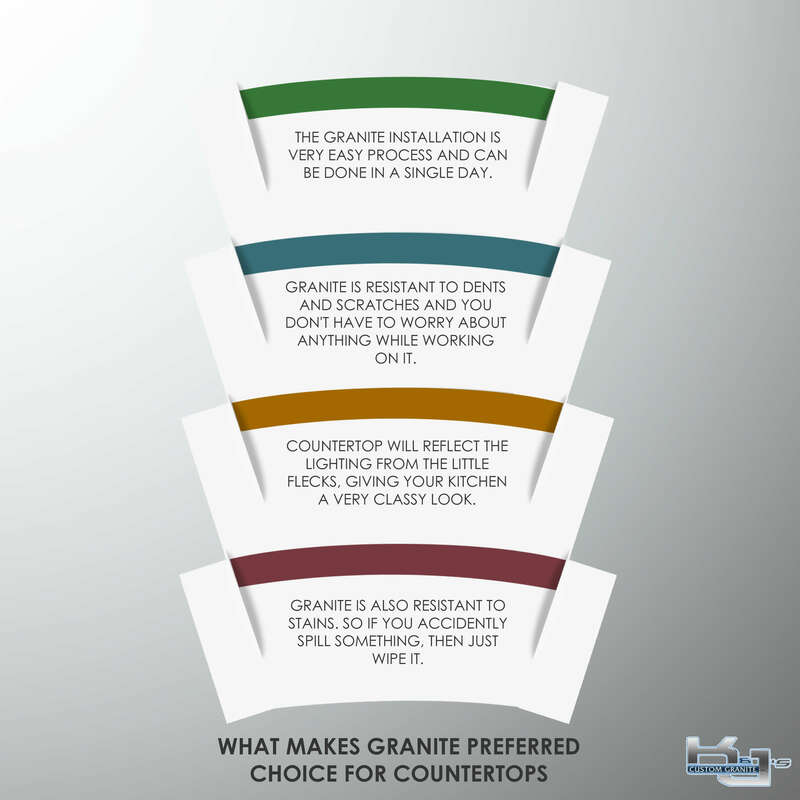 Today, we are going to discuss some of the points that makes granite preferred choice for countertops. Installing granite is a very easy process. You don’t have to spend days taking care of it as it can be done in a single day. For the best installation, make sure that you are calling in the professional technicians to do the job. The whole process is quite easy, as the exact dimension of the countertop is taken before cutting the slab according to the proportion. The granite takes less than a day to get set. Granite is resistant to dents and scratches and you don’t have to worry about the spill marks while working on them. This makes them perfect for the use in the kitchen, as they are resistant to scratches, spills, and dropping the utensils. If you have granite countertop, then you can do all of the kitchen work without worrying a bit. As the surface of the granite is very hard, you don’t have to worry about the scratches from the knives and you can move the utensils on the surface easily. Granite has little flecks on the surface that reflect the light. When you switch on the lights of your kitchen, the flecks starts to shine in different ways as each of the flecks has a different design and pattern. This gives your countertop a starry look and it feels like many stars are reflecting the light of the kitchen. This makes your kitchen look really classy as each of the design elements of the granite comes to life, giving its surface a very amazing look. Granite is resistant to spill marks. So if you use a lot of liquid in your kitchen then you don’t have to worry about any marks on the surface of the granite. Many stones tend to get the marks from the spillage of wine and curry. If you have a granite countertop and you spill wine on the surface, then all you have to do, is to wipe the wine with a damp cloth and you will be done. It won’t leave any marks on the stone. The granite is also very easy to clean and maintain and you don’t have to use any special ways to clean it.